When I first started complaining about there being no whiskey anywhere in or around Phoenix, a chorus of objections arose, insisting on one exception -- an oasis in my whiskey desert. "Yeah...there's no whiskey out here. Except for Magnum's, I mean." "You've been to Magnum's, right? Dude...Magnum's! You haven't been to Magnum's?!" I hadn't. But now I have. And here's what I found. First of all, to get to Magnum's, just find your way to the southeast corner of 7th St. and Union Hills in north Phoenix. Once there, bypass the Dairy Queen, Ladies' Fitness Express, and the Bashas' grocery store -- locate the Scuba store and head west. If you hit the Firestone tire shop you've gone too far. It just seems odd to me that a place as revered among whiskey lovers for it's extensive (and often expensive) collection of whiskies is in such a nondescript strip mall. Once inside, Magnum's is split into a retail area and a cigar lounge area. In the retail area a large selection of beer resides in a refrigerated area in front of you as you walk in. These are all easily accessible to patrons. The spirits however, unlike any other store I've been to, are stashed safely away behind a counter -- safely out of the reach of the grubby hands of the masses. You'll have to lean and squint at times to see what they have. Ultimately though, I found all of the rumors to be true; on this trip they had not-a-few very hard-to-find whiskies that I had to decide between. They were selling a Colonel EH Taylor Barrel Proof for $93. They also had a Blanton's Special Reserve Single Barrel, selling for $200. (I was repeatedly reminded that one cannot typically buy this product in the states, thereby justifying its high price). There was also a bottle of Four Roses Limited Edition Single Barrel for just over $100. 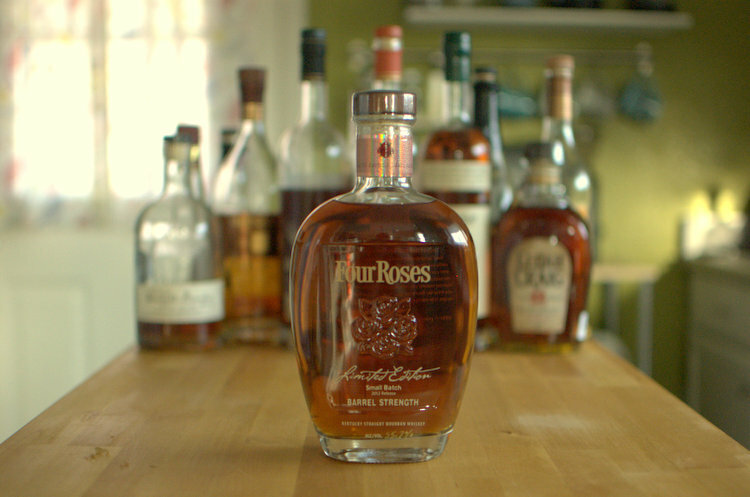 Ultimately, I couldn't pass up the 2012 Four Roses Limited Edition Small Batch. I've heard too many good things about this one to let it go, even at $116. Walking through the door from the retail side to the lounge side, one enters a world of wood, leather, and tobacco. Magnum's is one of two indoor-smoking cigar and spirits lounges in the Phoenix area (the other being Fox Cigar Bar). When I looked at the menu I was shocked to see a pour of Buffalo Trace costs $10. I voiced my dismay at this and was informed that the price per pour is determined by how many pours a bottle will produce and how expensive the bottle is. When I pointed out that I could buy a bottle of BT for $24, I was told that $10 is the (seemingly arbitrary) minimum price for any pour at Magnum's. After I explained that this policy will likely alienate many potential patrons, I was told that the BT is one of their best sellers in the lounge. It is apparently worth it to Magnum's to marginalize a key segment of its client base (the whiskey enthusiast segment) because there are enough people in the Valley who are so excited to drink and smoke inside that they'll pay $10 for a pour of mediocre whiskey. Fair enough. In summary: Magnums is a great place to buy rare and hard-to-find whiskies (albeit at inflated prices), but not to try -- unless you really want to drink and smoke inside and can't do so in your home.